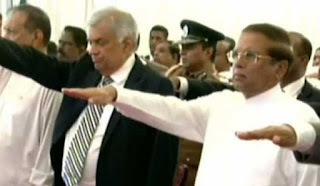 Representatives of all religions, members of the government and opposition members of the Parliament, governors of the provinces, chief ministers and representatives have taken this oath against drugs. This event is being live streamed through electronic media and will be simultaneously telecast to institutions, public servants, school children and the general public. The drug prevention national programme titled “Mathin Nidahas Ratak” programme is being successfully implemented across the country with the support of all the parties, with the aim of achieving economic and social prosperity for Sri Lanka while accomplishing sustainable development goals, the President’s Media Division (PMD) says. The President believes that the illegal drug trade, which has spread like a major menace, could not be controlled only through taking illicit drugs into custody by security forces, raids or taking legal actions alone and the time has come to eliminate this threat through implementing a broad attitude change initiate from family to the entire society, the PMD said. Marking the approach to this initiative, the whole nation will take the Bak Maha Divuruma (National Pledge to eradicate drug menace) today to commit themselves to control and eliminate the illegal drugs, the release said. The program, launched under the guidance of President Sirisena, will continue to invite all Sri Lankans to join together to make Sri Lanka a drug free country.